The 28th Men’s Southbroom Amateur Classic was played from 9th – 13th July 2018. It was a successful tournament played in perfect winter conditions with lots of entertainment, food, drink friendship and laughter involved! The 2018 Men’s Amateur Classic WInners, Ig Erasmus & Rudie Venter! Leading up to the start of the tournament, the weather forecast’s for Day 1 & 2 had many worried about wet & windy conditions. However as the sun rose on Monday morning many were pleasantly surprised to see blue skies and calm conditions. This however would only bless the morning field as a light breeze got up in the afternoon, giving the course some much needed defense. Being the middle of winter, approaching Southbroom with a sort of links approach, there are some serious points out there for you. After Day 1 we had 5 teams locked on 47 points with Rob Meydell & Pierre VD Walle sneaking the win with a well played 26 pts on the back 9 to win the count out. Tuesday’s weather was perfect, sunny with no wind and that translated to better scoring. Grant Harding & George Farndell won the day amassing 50 but again there was a count out separating the winners from the rest with Daniel Gouws and Johan Blignaut narrowly missing out. At the halfway mark of the tournament, 3 points separated the top 6 teams. But as it goes, Day 3, also known as moving day saw eventual winners Ig Erasmus & Rudie Venter create a 4 point lead at the top with a stellar 49 pts. Counting out Dave Donald & Jan Pienaar who had done their championship no harm with a near 50 point haul. It was as if we had been looked after with regard the weather, as the Final round got underway on Friday so the wind picked up, and a light rain fell soon after the final players had signed their cards and cracked their first beers. Ig and Rudie shot a solid 47 points on Friday to keep Pierre vd Walle and Rob Meydell at bay, winning the tournament by 8 shots. 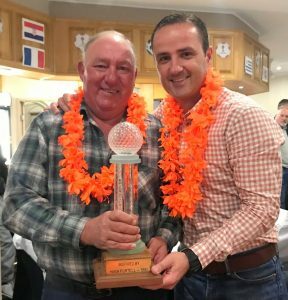 Jan-Hendrik Marais & Jaco Spamers shot a 51 pts on Friday to 3rd place overall, with Dave Donald and Jan Pienaar rounding out the Top 4 with a very competitive final two days. Overall it was a fantastic tournament, and a huge congratulations to Ig Eramus & Rudie Venter. Ig won his first Men’s Classic on his 19th attempt!So to the end of a wonderful weeks golf and fun and a big thanks must go out Hibiscus Brokers & Barry Elliot for being our Umbrella Sponsor and to all our other wonderful sponsors who make the event so special. Click here to be placed on the 2018 invitation list – Monday 1st to Friday 5th July 2019.